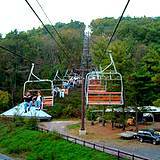 Knoebels Amusement Park offers old fashioned family fun with Camping, Log Cabins, Swimming, Amusement Rides, Education Programs and Entertainment that can only be found high atop the Allegheny Mountains. Best of all you'll enjoy Free Admission. Have you ever wondered what happened to the traditional Pennsylvania Amusement Parks with family entertainment and educational programs you enjoyed as a child? It's a beautiful place to take your family without the worries of heavy traffic, long waiting lines, family friendly prices and lots of good food. Treat you family to an old fashioned family fun vacation and show your children how exciting a Pennsylvania Amusement Park can be while enjoying the simple things in life. The ride through the Allegheny Mountains with spectacular views is worth the trip. 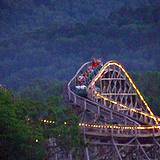 Knoebels Amusement Park got its start at the turn of the century. Harry Hartman Knoebel started out charging 25 cents to water and brush the horses for the visitors while they went swimming and picnicing on his property. Eventually he added picnic tables and sold ice cream and snacks to the children. Around 1926 Harry Knoebel added a swimming pool, cottages, and a carousel. By the 1940 Knoebels Amusement Park and Rustic Resort was born. Creating the most unique Pennsylvania Amusement Park in the U.S..
Knoebels Amusement Park is forever expanding and adding new Amusement Rides and Family Entertainment. In 2006 you were treated to a brand new Amusement Park Ride called, "The Looper". This ride will tumble you upside down and spin you around. 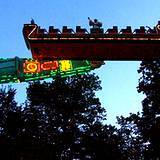 There are approximately 47 Amusement Park Rides to choose from. From thrill rides, to family rides, to kiddie rides. Including two World Class Wooden Roller Coasters, the Phoenix and the Twister. You are welcome to take a picnic along, or enjoy one of their restaurant or snack stands. Knoebels will even cater your picnic for you. Take a break and let your hair down at one or all of the Family Entertainment Attractions. Choose from a Musical and Magic Shows at the Theater. 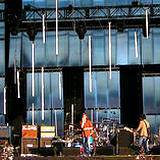 Or enjoy an outdoor show with Singing Troops and Large Bands. 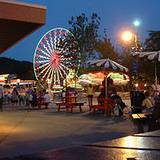 Either way you'll leave this amazing Pennsylvania Amusement Park with memories to last your family a lifetime. Last be not least, you can't go wrong taking your family swimming in their beautiful crystal clean swimming pool. You can climb on the Ball Crawl & Climbing, drift along on an Intertube, or enjoy the 4 thrilling Waterslides. The beautiful Waterpark offers nearly 4 acres of area to sunbath. There is a picnic area and refreshment stand. Plus there is an area for your little swimmers to play in the playpool. 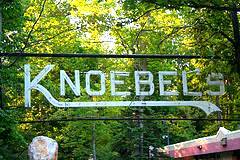 Knoebels Amusement Park also offers educational tours for school groups or even homeschooling groups. Learn about the Bald Eagles and how they mate for life. Study Bald Eagles at the Bald Eagle habitat. Study Physics through a series of activities and what 5 of Knoebels Amusement Park Rides has to do with Physics. One of the most beautiful and unique areas at Knoebels Amusement Park is the Campgrounds and Cozy Log Cabins. You'll enjoy 160 scenic acres and over 500 sites. All campsites include Tent Platforms and Electric Hookups. It's one of the few Pennsylvania Amusement Parks that offer PA camping. Don't worry about forgetting supplies. The Trading Post campstore has anything your family would need to be comfortable. There is also a Family Restaurant in the camping area to enjoy a great breakfast. You can even go to Worship service every Sunday morning. Talk about thinking of everything. 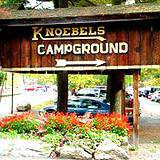 Knoebles also offers a shuttle bus from the campground to the beautiful Pennsylvania Amusement Park. 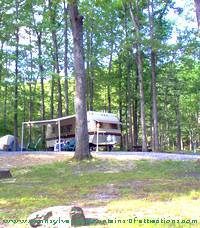 The campgrounds and park are nestled in the Allegheny Mountains among Natural Streams and Shady Hemlock Trees that keep the temperatures a good 10 degrees cooler than elsewhere in the area. There are many attractions to visit through the Allegheny Mountains. 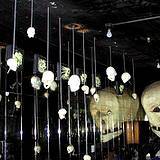 Take your family on a really exciting adventure and visit some of our Haunted PA Attractions. Or if you'd enjoy visiting something a bit more calm and spiritual. Take a ride through the Allegheny Mountains and visit one of the most beautiful places in the United States. Mount Assisi Sunken Gardens will lift your spirits and enchant you with it's beauty. While you're on vacation go a little out of your way and pay honor to our Viet Nam Veterans and visit The Wall That Heals in Altoona, PA. While you're visiting Altoona why not spend your day at Lakemont Park and take ride on the Worlds Oldest Roller Coaster. If you love Italian food visit DelGrosso Park on Spaghetti Wednesday. Take a ride on their award winning antique carousel. I'm sure once you figure out all the wonderful attractions Pennsylvania and the Allegheny Mountains has to offer you'll want to visit again and again. Who Can Resist A Haunted House? 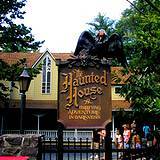 There's nothing like a good old fashioned Haunted House to make family memories in a Pennsylvania Amusement Park. 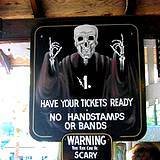 You don't have to wait until Halloween to visit Knoebels Haunted House. You'll find yourself going in laughing and coming out screaming. Each room is filled with unique decorations, sound effects, and things that go bump in the dark. Tour the Haunted House over and over again and you'll see something different each time to scream about. It's a family adventure that is rare to find.